Patrick Mahomes passed for 375 yards and three touchdowns Sunday, while running back Kareem Hunt scored three touchdowns as the Kansas City Chiefs maintained the best record in the AFC by drilling the host Cleveland Browns 37-21. The 300-yard passing performance was the eighth straight for Mahomes, who has 29 touchdown passes. Browns rookie quarterback Baker Mayfield completed 29 of 42 passes for 297 yards and two touchdowns with one interception. Cleveland (2-6-1) suffered its fourth straight loss. It also marked Gregg Williams’ debut as head coach after the Browns fired Hue Jackson. The Chiefs (8-1) scored on six of their first seven possessions, did not punt until the fourth quarter and averaged 8.6 yards per play. Five receivers had 50 or more yards, led by tight end Travis Kelce with 99 yards on seven receptions, with two touchdowns. Tom Brady passed for 294 yards and a touchdown as host New England pulled away for a win over Green Bay. James White rushed for two touchdowns and Cordarrelle Patterson rushed for one more for New England (7-2). 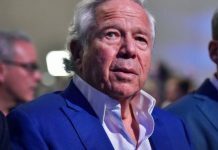 Julian Edelman threw a key 37-yard pass to White on a trick play in the fourth quarter to set up the Patriots’ go-ahead score. Aaron Rodgers completed 24 of 43 passes for 259 yards and two touchdowns in a losing effort for Green Bay (3-4-1). Stymied for much of the second half after a 35-point first half, Drew Brees connected with Michael Thomas for a 72-yard touchdown with 3:52 left, his fourth touchdown pass of the game, to lift host New Orleans over previously unbeaten Los Angeles. Thomas caught 12 passes for 211 yards — a franchise single-game record for receiving yards — and Brees completed 25 of 36 passes for 346 yards for the Saints (7-1). Brees also threw scoring passes of 16 yards to Alvin Kamara, 4 yards to Tre’Quan Smith and 13 yards to Benjamin Watson. Los Angeles (8-1) allowed a season high in points and lost for the first time since Jan. 6, when it fell short against the Atlanta Falcons in the NFC playoffs. James Conner continued to excel with 163 yards from scrimmage and a touchdown catch as visiting Pittsburgh downed rival Baltimore. Conner, the AFC offensive player of the month for October, rushed for 107 yards and had 56 receiving yards against the top-ranked defense in the NFL. He became the first player in Steelers history with 10 touchdowns in the first eight games of a season. Ben Roethlisberger passed for 270 yards, including touchdowns to Conner and Antonio Brown, as Pittsburgh (5-2-1) won its fourth straight. Baltimore (4-5) has lost three straight. Danielle Hunter returned a Matthew Stafford fumble 32 yards for a touchdown and host Minnesota Vikings defense sacked Stafford 10 times into top Detroit. Kirk Cousins completed 18 of 22 passes for 164 yards and a touchdown for the Vikings (5-3-1). Adam Thielen caught Cousins’ touchdown pass but was limited to 22 yards on four receptions. He entered the game having tied an NFL record by reaching 100 yards receiving in each of the first eight games of the season. Stafford completed 25 of 36 passes for 199 yards, Minnesota outgained Detroit 283-209 and the Lions (3-5) ran for only 66 yards. Brandon McManus missed a 51-yard field goal attempt as time expired and Houston held on to beat host Denver for its sixth consecutive victory. Broncos quarterback Case Keenum passed for 290 yards and a touchdown and completed a crucial 18-yard, fourth-down pass to Emmanuel Sanders to help set the stage for McManus, who earlier missed a 62-yard attempt. Like that errant kick, McManus’ would-be game-winner sailed right. Ka’imi Fairbairn drilled a 37-yard field goal with 14:06 remaining to give the Texans (6-3) the lead for good. Keenum had pushed the Broncos ahead 17-16 with his 12-yard scoring pass to Jeff Heuerman with 5:57 remaining in the third quarter, the first and only lead for Denver (3-6). Jordan Howard ran for two touchdowns and the Chicago defense scored twice for 28 points in the second quarter and the Bears blew out host Buffalo. Cornerback Eddie Jackson returned a fumble 65 yards for a touchdown and defensive end Leonard Floyd scored on a 19-yard interception return less than four minutes later for the Bears (5-3), who have four defensive touchdowns this season. Buffalo (2-7) scored a touchdown for the first time in three games but was held to less than 14 points for the seventh time this season (and sixth game in a row). The Bills have now totaled 96 points through the first nine games, the fewest in franchise history. 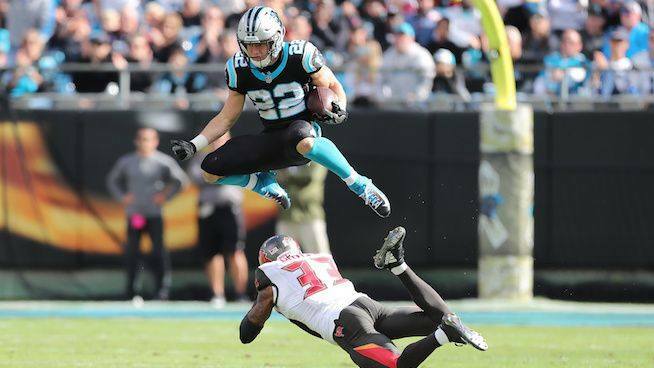 Second-year players Curtis Samuel and Christian McCaffrey each scored two touchdowns as Carolina Panthers turned a record-setting first half into a 14-point victory against visiting Tampa Bay. Samuel’s 19-yard touchdown catch with 9:04 remaining halted Tampa Bay’s momentum as the Panthers (6-2) won their third game in a row. McCaffrey ran for a pair of first-half touchdowns as the Panthers set a franchise record with 35 first-half points. Tampa Bay quarterback Ryan Fitzpatrick returned to the starting lineup, replacing erratic Jameis Winston, and threw for 243 yards and four touchdown passes but was intercepted twice as Tampa Bay fell to 3-5. Matt Ryan passed for 350 yards and four scores, including Julio Jones’ first touchdown reception of the season, and visiting Atlanta ended Washington’s three-game winning streak in a blowout. Jones had seven catches for 121 yards and caught a 35-yard touchdown pass with 3:45 left to play, setting off an Atlanta celebration. Running back Tevin Coleman had two touchdown catches and rookie wide receiver Calvin Ridley had another — from 40 yards — for the Falcons (4-4). The Redskins (5-3) pulled to within 28-14 with 2:15 left in the third quarter when running back Kapri Bibbs scored from 3 yards out, but Atlanta added 10 fourth-quarter points. Melvin Gordon returned after missing a game and rushed 16 times for 113 yards and a touchdown to lead Los Angeles over host Seattle. Gordon, who had been sidelined with a hamstring injury, scored on a 34-yard run in the second quarter, giving the Chargers (6-2) the lead for good. Philip Rivers completed 13 of 26 passes for 228 yards and two scores, both in the first half. Los Angeles defensive back Desmond King seemed to cap the victory with a 42-yard interception return of a Russell Wilson pass with 6:44 remaining, making it 25-10. 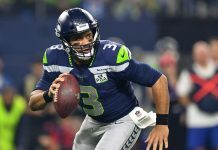 It marked the lone interception for Wilson, who completed 26 of 39 passes for 235 yards and two touchdowns for the Seahawks (4-4). Rookie Jerome Baker broke open a close game with a 25-yard interception return for a touchdown in the fourth quarter as host Miami topped AFC East rival New York. The Dolphins (5-4) snapped a two-game losing streak while the Jets (3-6) have lost three games in a row. Jets rookie quarterback Sam Darnold was intercepted a career-high four times. Miami led 6-3 when Baker made his play, cutting in front of a receiver on the right sideline. It was Baker’s first career interception, and it was preceded at the start of the play by a bad shotgun snap from center Spencer Long, who has a dislocated middle finger.